Our girls are able to pursue their passions with excitement and purpose. At Wynberg Girls’ High we encourage our girls to stretch their hearts, minds and bodies. Through our house and tutor group system, rich and enduring friendships are created. We work collaboratively towards providing our learners with the skills necessary for critical and independent thinking. We immerse our learners in experiences that prepare them for leadership in a challenging and changing world. We work collaboratively towards providing our learners with the critical thinking vital for their success in this world. Learners who thrive take advantage of the opportunities offered in the four foundational pillars: academics, culture, service and sport. We create a genuine sense of community by fostering relationships across the grades within the House and Tutor Group systems, and the extra curricular programmes. "Wynberg Girls' High School is a value-based, eco and socially conscious learning environment encouraging the development of confident and unique women who strive for excellence." 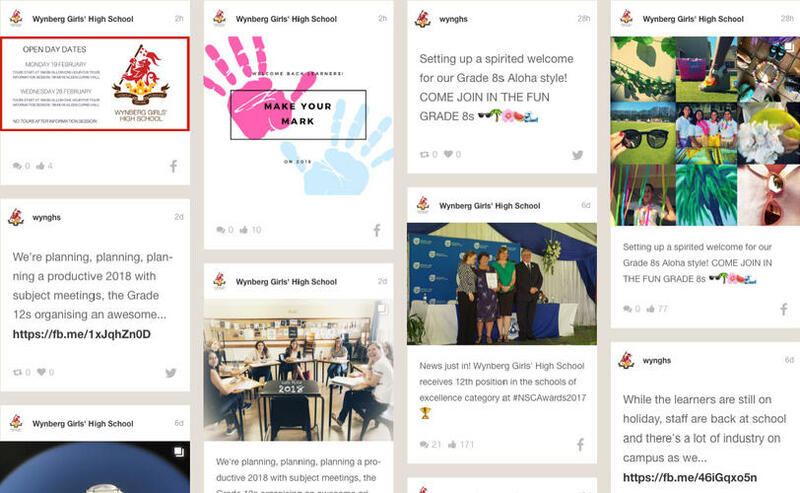 Get a glimpse of the many wonderful and exciting activities at WGHS through our Social Wall. And while you’re there, subscribe to our Facebook, Twitter, Instagram or YouTube social profiles to stay updated with our ongoing school life.